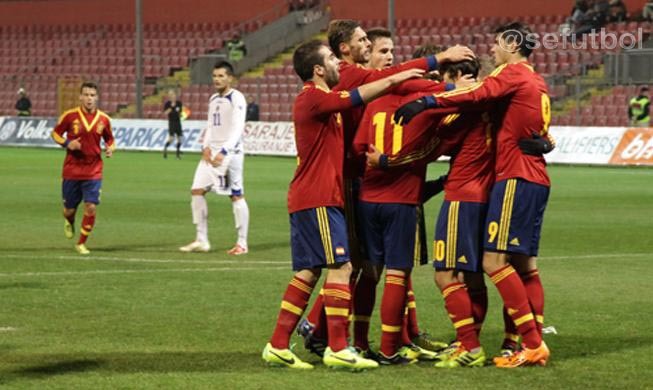 The Spanish U21 squad has battled against Bosnia under initial circumstances. On one hand the locals planned a tough match for the men led by Lopetegui with talent in the centre pitch and perfect interpretations in counterattacks in all ball recovery. Jagodic's team did not wince at the post shot by Muniain and before the first quarter hour was over they made the most of it, just like in the first leg against Murcia, getting ahead with an accidental shot by Prcic from the front. Spain, in high spirtis, continued displaying the football they're used to: touch, posession, protagonism on the sidelines... A magistral formula which had effect in the first thirty minutes when Gerard Deulofeu appeared on the right to put the ball at the back of the net, habitat of Álvaro Morata. The Madrid player did not get to connect with the ball, but the defender Barisic put it in with the intention of clearing the draw. The Balkans draw was disactivated and the Spanish side had the luck of counting on players lik Sergi Roberto and Óliver Torres who took the chance after a pass to get beyong the lines and stalling the Bosnians. When the first half came to an end, a penalty whistled by the Dane Jokob Kehlet got Morata ahead as the second top scorer in this category (with 12 goals, the same as Óscar García Juyent and only three more than Rodrigo Moreno) and, pointed out the Zenica battle on the Spanish side. In the second half they proved that the team was still hungry for the glory and looking to emulate former generations. With Deulofeu riding on the right and becoming his teammates best friend setthe ball up for quality shots after slaloming through the Bosnian players in a second half that got him close to the captain Muniain seconds later. Another pass by Deulofeu got to Jairo, debutant, who got it across to Óliver Torres who scored his second goal of the night. It was right for Deulofeu to score after his stellar performance and was sure to win against the locals. The constant and reliable formula used by Lopetegui's men got them once again ahead on the scoreboard and will leave Zenica with a fond memory after winning by 1-6 in a stellar match, where the international footballers proved their worht. 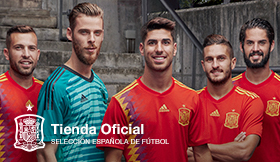 On Monday they face Albania, looking to continue with their winning streak, because in a hypotheticla win and loss for Austria, the Spanish squad would set their place at the European Cup in 2015. Mikel Merino: "We're happy with the win"
Luis de La Fuente: "I'm happy with the team's performance"